In this review we feature the best Bluetooth transmitters for headphones that allow you to stream music directly from your TV console or PC device. These Bluetooth transmitters are equipped with the latest Bluetooth technology to provide aptX sound transmission and low-latency signal. This means that you would be able to listen to music performances without any dips in sound quality or lag. Some of these Bluetooth transmitter for headphones also come with the ability to connect to multiple headphones at a time, which allows more than one person to listen to a single audio source. If you are looking for some of the best Bluetooth transmitter for headphones, be sure to check out our top picks below! The TaoTronics transmitter tops this list as one of the best Bluetooth transmitters for headphones that delivers crystal clear sound performance and detailed sound quality. It is essentially a receiver and transmitter combined into one and can be used to transmit and receive audio signals. Furthermore, it comes with the latest Bluetooth 5.0 and can pair up to two headphones at once. We liked the fact that the TaoTronics transmitter features optical and 3.5mm inputs so that you can get maximum flexibility with support for both 3.5mm and optical (TOSLINK) digital inputs from your TV or audio device. The key thing about the TaoTronics transmitter is that it supports aptX low-latency technology which eliminates Bluetooth delay, so you can watch TV and movies and listen to high-clarity sound in perfect synchronization. The aptX low-latency mode only supports TX (transmission) modes. The transmitter is great for constant streaming and automatic pre-pairing – it has a built-in internal battery that provides up to 15 hours of continuous music playtime, and automatically re-pairs with existing paired devices. We also liked the fact that the TaoTronics has cable-free roaming functionality – you can keep your old stereo or wired headphone alive with the new Bluetooth wireless connection, and pair with your smartphone or tablet device from up to 30 feet away. 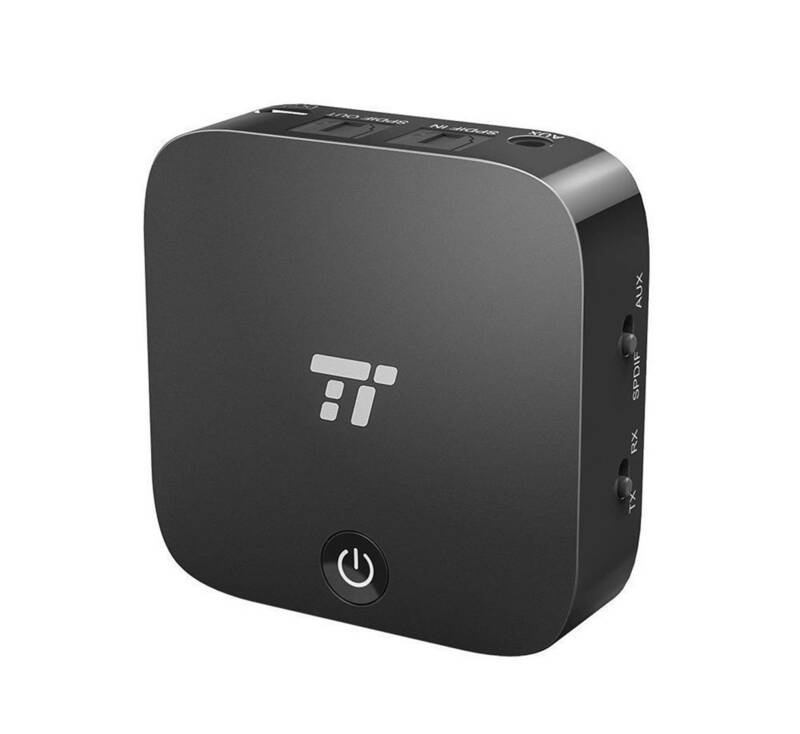 Overall, if you are looking for one of the best Bluetooth transmitter for headphones, the TaoTronics transmitter is a cost-effective option that comes highly recommended. The Mpow Bluetooth transmitter for headphone is a highly versatile transmitter with both transmission and receiver modes (TX and RX modes). This allows you to pair the transmitter with your Blueototh headphones or speakers and enjoy audio from non-Bluetooth devices such as your TV or PC console devices. In receiver mode, the Mpow receiver provides CD-like music for non-Bluetooth devices by pairing with your mobile device. The Mpow transmitter supports dual connectivity and Bluetooth 4.1 technology – it can be paired with two Bluetooth headphones simultaneously to allow more people to listen to the same audio source. We also liked the fact that the Mpow transmitter supports safe hands-free calls – it comes with a built-in microphone for you to take hands free calls while driving. The Mpow Bluetooth transmitter is designed with independent +/- volume button controls to allow you full controls over the volume and play. It comes with a built-in battery that provides up to 12 hours of continuous wireless music playtime on a single charge; it also has NFC technology which automatically re-pairs the device with your last paired device. The entire package comes with the Mpow Bluetooth transmitter, micro USB charging cable, 3.5mm audio cable, 3.5mm audio adapter, RCA cable and user manual for easy reference. Overall, these are some of the best Bluetooth transmitter for headphones that are easy to use straight out of the box and we highly recommend them. The Avantree Priva III is a Bluetooth transmitter designed for headphones that provides high quality sound transmission. The transmitter is designed for analog and audio output devices, and is the perfect solution to enable Bluetooth streaming from any device with analog output audio performance. It can be paired with a TV or PC device with RCA audio out connections, with an AV receiver with a big headphone jack. Do note that this Bluetooth transmitter does not support optical audio outputs. We liked the fact that the Priva III has low-latency connectivity without any audio delay, so you can listen to music or watch movies without any noticeable lag time. You can simultaneously stream audio to 2 headphones with no lip-sync delay while watching TV, movies or games – however, your headphones need to support aptX low-latency for this to work properly. The Priva III Bluetooth transmitter for headphones provides long range and is easy to connect. It comes with a Class 1 Bluetooth technology transmitter which transmits audio up to 100 feet distance away without any issues. In addition, the Priva III supports auto-reconnect NFC pairing functionality which automatically pairs to your last paired headphone device. The key advantage of the Priva III is that the transmitter runs on USB power from your audio device’s USB port (i.e., the TV USB port). Alternatively, you can also charge it using your phone charger or any USB port. Overall, the Avantree Priva III is one of the best Bluetooth transmitter for headphones and is ideal for PC use since it supports digital USB audio output and pairs with your Bluetooth headphones instantly. The HomeSpot is one of the best Bluetooth transmitter for headphones that can turn your regular stereo audio device (including PC and TV) into a Bluetooth-enabled wireless streaming platform for your headphones. It can connect to your non-Bluetooth device via the 3.5mm audio-output and stream music directly to your Bluetooth-enabled headphones for crystal clear sound performance. We liked the fact that the HomeSpot transmitter supports dual streaming audio, which can transmit music to two Bluetooth devices simultaneously. The audio and video performances are in sync with aptX technology which allows for virtually no-lag in audio transmission. The HomeSpot provides multiple input options, including 3.5mm audio jack, RCA, optical TOSLINK and is universally compatible with TVs, PCs and other non-wireless music sources. The HomeSpot Bluetooth transmitter for headphones is relatively simple to use and can connect to your Bluetooth device with one press of the Bluetooth pairing button. The repairing functionality is automatic as the transmitter automatically remembers the last paired device. The HomeSport provides high fidelity audio quality and minimized lip sync latency with any aptX enabled device. The entire package comes with the HomeSpot Bluetooth transmitter, optical Toslink audio cable, 3.5mm audio cable, RCA cable and 3’ micro USB cable. Overall, it’s a compact and versatile Bluetooth transmitter for headphones and we highly recommend them. The AirFly Bluetooth transmitter for headphones is a well-designed and compact Bluetooth transmitter that works well with wireless headphones and AirPods. The transmitter allows you to connect wireless headphones with Bluetooth 4.1 technology by plugging it into non-wireless music sources via the headphone jack. You can easily listen to your TV or AirPods using the AirFly transmitter without any issues. It is also compatible with Nintendo Switch for a wireless gaming experience with your Bluetooth headphones. The AirFly uses Bluetooth 4.1 for high quality music streaming, and supports aptX low-latency codecs with SBC audio, and has a battery life of up to 8 hours of continuous transmission time. 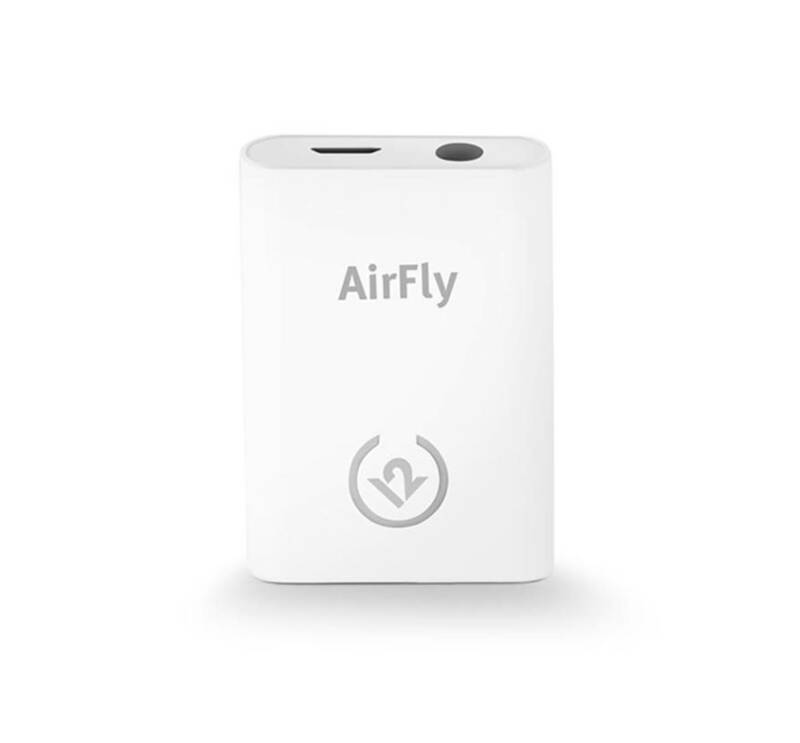 The AirFly can also be used to connect to your Bluetooth headphones to airplane in-flight entertainment systems using the headphone jack, and transmits high quality sound. It has a travel-friendly size that occupies minimal space and comes with a travel pouch that holds both the device and the charging cable. Setting up the AirFly Bluetooth transmitter is simple – you simply need to plug it into a headphone jack, press the pair button the front and pair the device to your wireless Bluetooth headphone. The entire package comes with the AirFly Bluetooth transmitter for headphone, 3.5mm headphone cable, USB charging cable, travel pouch and quick start guide for easy reference. The Miccus is one of the best Bluetooth transmitter for headphones with very long wireless streaming range. 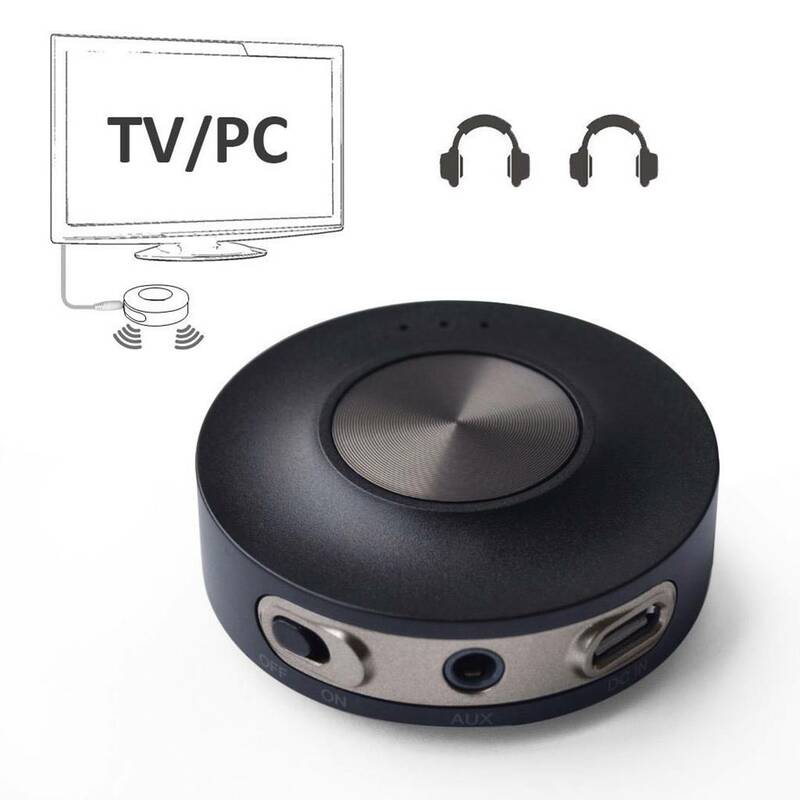 This Bluetooth transmitter for headphones allows you to stream music from up to 160 feet (50m) away with a high power Class 1 Bluetooth receiver that surpasses 33 feet limits. You can transmit or receive audio throughout your home or outdoors to the patio, pool and backyard – it also provides you the option of boosting signal range with the X7 antenna by 20 to 40 feet. The Bluetooth transmitter (select TX mode) allows you to transmit your music wirelessly to Bluetooth headphones or speakers and enjoy crystal clear audio with CD-like sound. It also features a Bluetooth receiver function which can convert your home stereo system into a wireless system by pairing with Bluetooth smartphone devices. In RX mode, you can listen to your phone or table on your speakers with full DJ control, change tracks or volume from across the room and go for long-range transmission without any issues. We liked the fact that the Miccus Bluetooth transmitter is easy to setup – it automatically reconnects to the last paired Bluetooth device. You can use this with smartphones, computers and Bluetooth speakers without any issues. It is the perfect device to connect to your TV and stream music directly to your Bluetooth enabled headphones for a wireless listening experience. The powerful long-range signal works for up to 160 feet (50m) distance without any lip-sync issues. Overall, the Miccus transmitter is one of the best Bluetooth transmitter for headphones and we definitely recommend them for audio enthusiasts. The Gold Armour Bluetooth transmitter is a high-reliable and efficient lightweight 2-in-1 Bluetooth 4.1 transmitter and receiver that can pair with two headphones and speakers at once. The transmitter features optical and 3.5mm inputs and output options for maximum flexibility; you can connect it easily to your PC, TV or home audio device and stream music to your Blueototh headphones. The hassle free setup makes it easy to use straight out of the box and comes with all the necessary wires required to get started (including 3.5mm auxiliary, micro USB cable and RCA cables). The Gold Armour transmitter is designed for instant sound performance and delivers low-latency sound performance which is 98% lower than other devices with aptX low-latency. The end-to-end lag time is less than 40 milliseconds for both input and output options, which makes it great for listening to music and watching movies. You can also watch TV, movie and video and listen to high-end clarity sound in perfect synchronization. 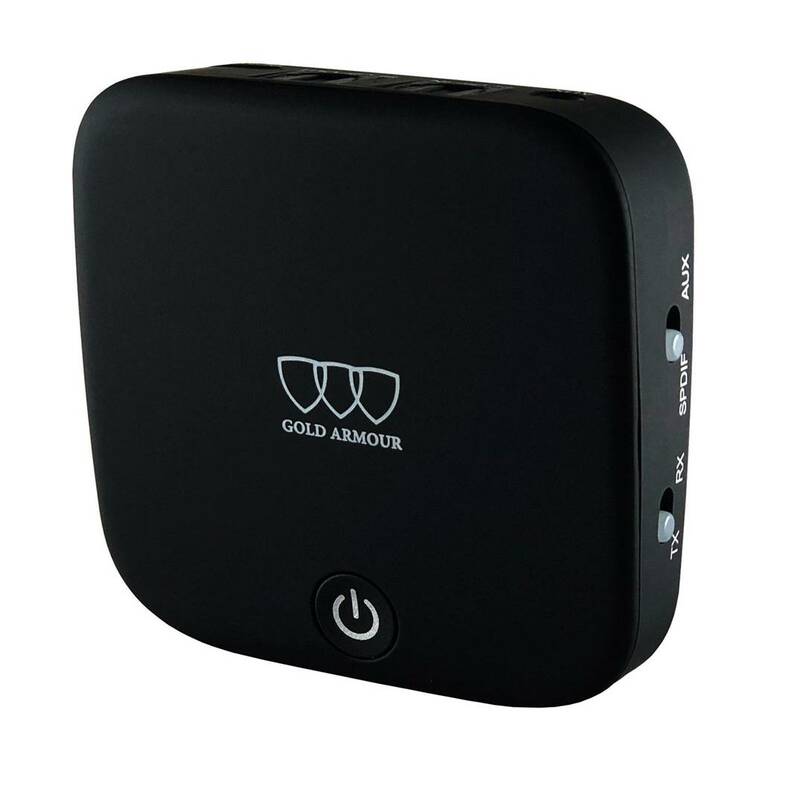 The Gold Armour Bluetooth transmitter provides constant streaming and automatic re-pairing, and comes with an internal battery that provides up to 15 hours of usage and is fully charged within 2 hours. The Gold Armour transmitter supports charging and streaming at the same time, and has NFC wireless functionality which automatically re-pairs with existing paired devices. If you are looking for a sleek and modern Bluetooth transmitter for your headphones, the Gold Armour is definitely a great choice for high-performance wireless audio. 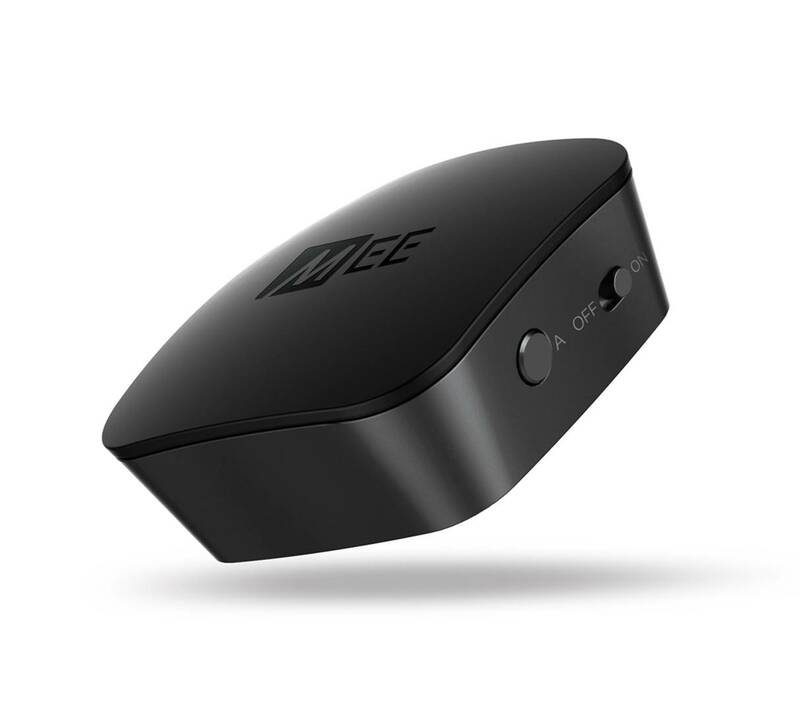 The MEE Audio is one of the best Bluetooth transmitter for headphones that delivers crystal clear audio transmission from non-wireless music sources. 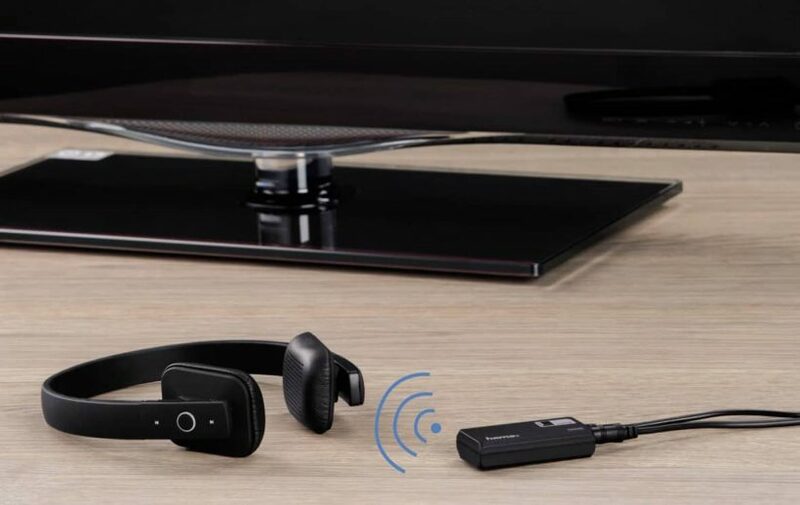 This transmitter specifically enables TVs and PC devices to stream high definition sound wirelessly to your Bluetooth headphones without any lag. 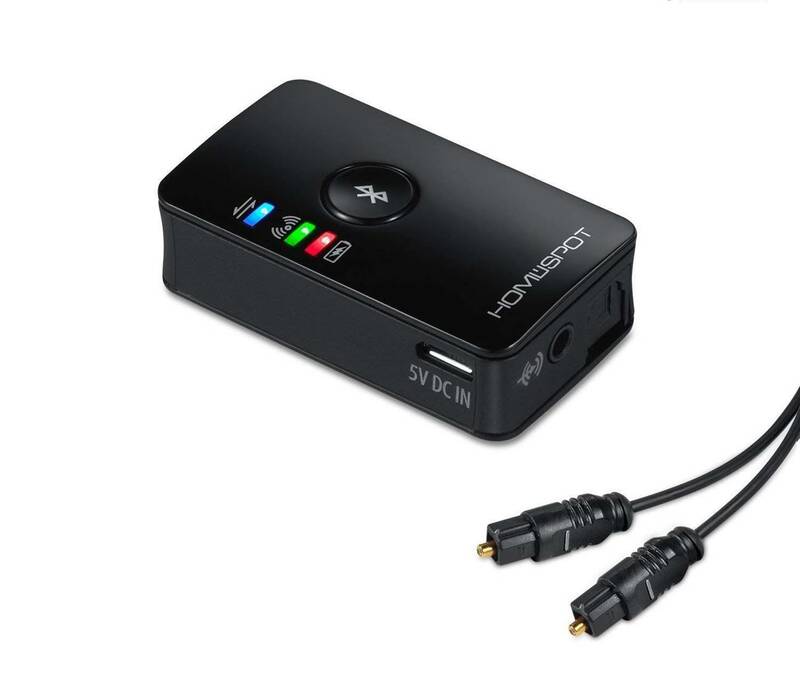 It features analog and digital inputs for compatibility with new TVs and other devices, and connects via 3.5mm headphone jack, RCA or optical TOSLINK S/PDIF – all the necessary cabling are included. The MEE transmitter streams audio to up to two Bluetooth headphones and speakers simultaneously The MEE Audio transmitter uses Bluetooth 4.0 with low latency technology for high-fidelity, lag free audio performance. It also has a compact and portable design with a built-in battery for use on the go. We liked the sound quality from the MEE Audio transmitter – the sound performance is high quality and we did not hear any lags or dips in sound quality. The MEE transmitter allows you to stream high-quality digital music to up to 2 headphones directly from your TV or PC, and automatically remembers your last paired headphone with NFC technology. The entire package comes with the MEE Connect Bluetooth transmitter, micro-USB charging cable, 3.5mm audio cable and 3.5mm to RCA adapter. It also has TOSLINK digital optical SPDIF audio cables for added connectivity options. Overall, it’s one of the best Bluetooth transmitter for headphones with multiple input options and is worth checking out. 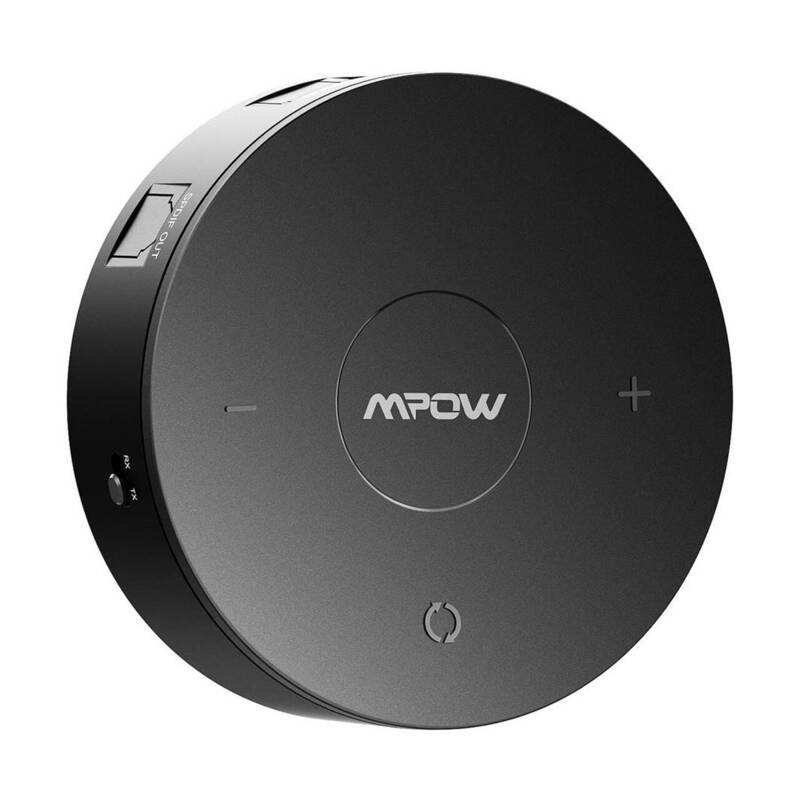 The MPOW is one of the best Bluetooth transmitter for headphones designed with Bluetooth 4.1 CSR for wireless music streaming. In transmission (TX) mode, it connects with non-Bluetooth devices (TV/MP3/MP4) to enjoy wireless audio with Bluetooth headphones. In receiver mode (RX Mode), it allows you to enjoy Hi-Fi music fro your phone or iPad on your car home stereo system. We really liked the fact that the MPOW supports aptX low-latency in both modes for you to watch TV, movies or listen to music with high-definition audio quality in perfect synchronization. That being said, do note that your headphones should support Bluetooth sound transmission for the aptX technology to work. 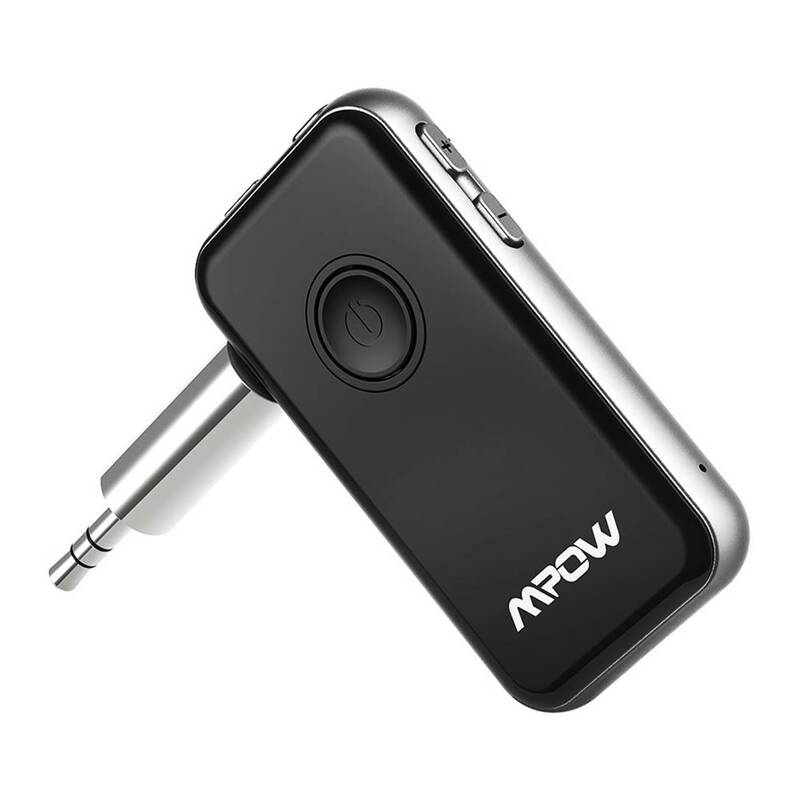 The MPOW transmitter comes with multiple connectivity options, including optical, RCA and 3.5mm audio connections. It is designed with these three different connection options to connect to a variety of devices including TVs and PC devices. You get maximum flexibility with support for both digital optical SPDIF and 3.5mm auxiliary inputs. The MPOW comes with an internal battery that delivers up to 10 hours of continuous music playtime on a 2 hour charge. The MPOW transmitter supports charging and streaming simultaneously – do note that you may need to reset the adapter to enjoy simultaneous playing and charging at the same time. The buttons at the top of the transmitter supports multi-channel volume and track control – you can adjust the volume via your receiving or transmitter terminals, or by simply pressing the buttons on the adapter. Overall, the MPOW is a fuss-free and simple Bluetooth transmitter for headphones and we highly recommend them. The APEKX is a versatile and simple 2-in-1 upgraded Bluetooth 4.1 transmitter that can be paired with two Bluetooth headphones simultaneously. This wireless transmitter continuously streams music even while charging, and has a built-in battery that delivers up to 8 hours of continuous music playtime, allowing you to enjoy wireless content all the time. 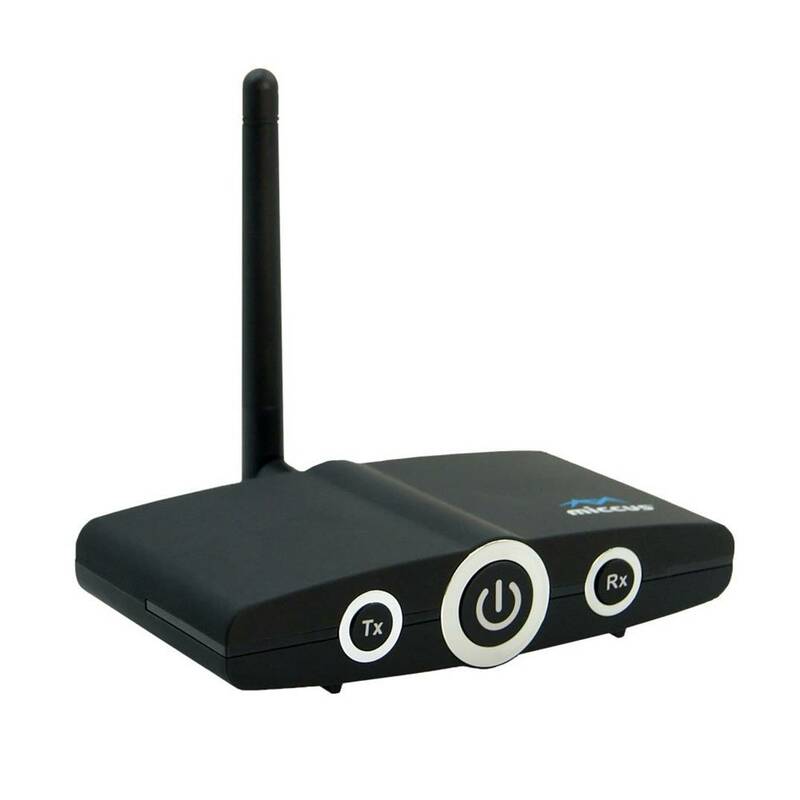 In transmitter mode, you can turn your non-wireless music source (i.e., TV, CD player or PC) into a Bluetooth device by plugging in the APEKX transmitter into the 3.5mm auxiliary input port. The receiver mode also works well for home or vehicle music streaming on the go. The APEKX is powered by the latest Bluetooth 4.1 technology which provides a richer and deeper sound experience with CD-quality sound. 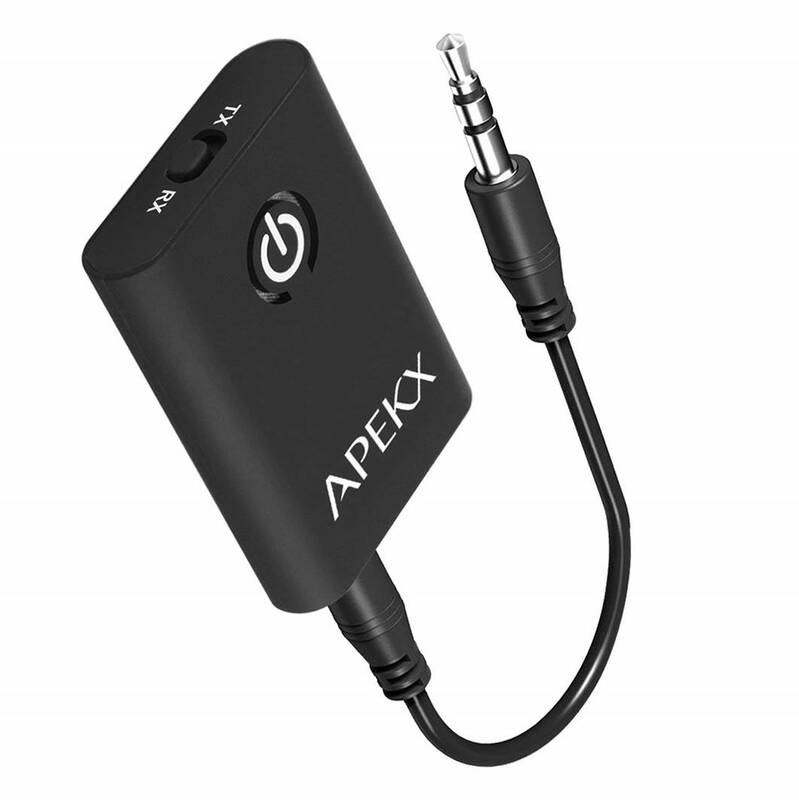 The APEKX Bluetooth transmitter is designed to be compact, portable and durable with battery protection. This Bluetooth transmitter automatically re-pairs with existing paired devices. It has a wireless transmission range of up to 49 ft (15m) and a 160mAh rechargeable battery that provides up to 8 hours of continuous music playtime. The entire transmitter is designed to be lightweight and weighs a mere 13g, with a dimension of 1.29” x 0.39” x 1.77”. The entire package comes with the APEKX Bluetooth transmitter, one micro USB charging cable, 3.5mm auxiliary cable and user manual for easy reference. Overall, the APEKX is one of the best Bluetooth transmitter for headphones that we have tested that delivers great value for money.